StBF got me an Ott Lite for my Birthday. I am so wicked excited right now. Bah, this no polish for two weeks thing is not going to last at all. I want to put some polish on so I can give this thing a test run. Heeee! For anyone who doesn't know what an Ott Lite is, it's supposed to show true to life colours. It's made for crafters and such. But it's awesome for us bloggers. Edit 3/27/2010: Here's a picture of my new lamp. I was so excited that I didn't even get all the packaging off before I took the pic. It's a lot bigger than I thought it'd be. (Steph @ Short 'n Chic: "That's what she said." *Rolls eyes* I swear, at least half of the things I say end up with someone tacking on a TWSS.) Anyhow, I sort of love this thing. I'm sure the novelty will eventually wear it. But it's awesome and amazing. It's too bad that it's so retarded expensive though. And here's a pic of some random polishes I had sitting on my desk. I have to play with the angles a bit more. 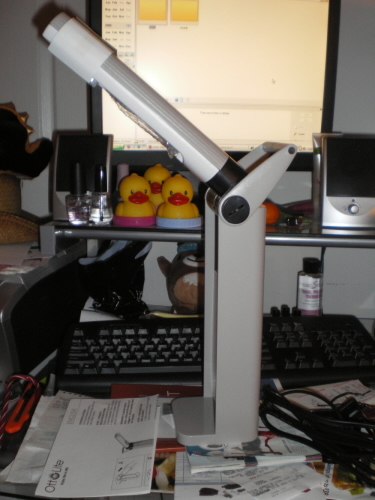 It doesn't help that I don't have much room on my desk, as you can see with the earlier pic, it's a wee bit cluttered. 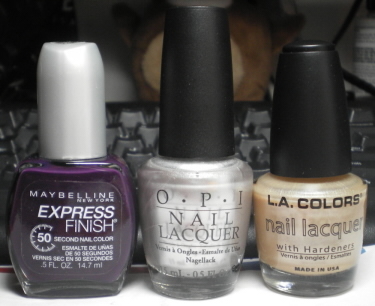 Those polishes are Maybelline Grapes Times, OPI Birthday Babe, and L.A. Colours Sand Storm, in case anyone's interested. I can't wait to see! I have been debating getting one for taking pics on my blog. Anyway you can do a with Ott and without Ott pic? ANSTAH: You are baaad. Lol. KrisInPhilly: Sure thing! That's a great idea. Happy Birthday! Cant wait to see the pics! Awesome! Thanks and Happy Birthday. Happy Birthday. You will LOVE your Ott Lite. I've got one that I use to take nail photos all the time. Thanks for showing this, thanks to you I found a reseller just a couple of miles from my home in Sweden. Now I'm gonna get me a lamp, and my mother is going to get a lamp with a magnifying glass. Thanks for the Birthday wishes everyone! And I will definitely do a post with lots of different lighting to show y'all what the Ott Lite does. What a neat birthday present! I'd never even heard of this kind of lamp before you posted about it. *Nods* I'd only heard about it maybe a month or so ago.